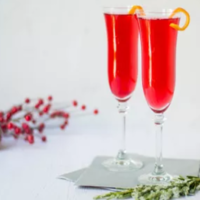 A Poinsettia is a cocktail made with orange liqueur, cranberry juice and champagne. 1-2-3 style. This recipe is the property of hibbadoray and released under the CC Attribution-NonCommercial-Sharealike 4.0 license. You may not copy, derive or commercialize this recipe without following the terms of this license or the explicit permission of the creator. Holy hell, this thing is perfect. The pink bubbly and Morning Mimosa combine into the absolute perfect taste of mimosa with pink champagne and orange liqueur. The cranberry juice side adds that just right amount of tart (that occasionally lingers in the throat even after exhale, and that's a GOOD thing. Adds authenticity) that sets it off perfectly. I went on a binge for these things after I'd first heard of them, and this totally captures it perfectly. Easy ADV, or a good treat to go with brunch. Nicely done!